St. Isidore of Seville, a 7th-century Doctor of the Church, depicted by Murillo (c. 1628) with a book, common iconographical attribute for a doctor. Doctor of the Church (Latin doctor "teacher") is a title given by the Catholic Church to saints recognized as having made significant contribution to theology or doctrine through their research, study, or writing. Some other churches have similar categories with various names. In the Western church four outstanding "Fathers of the Church" attained this honour in the early Middle Ages: Saint Gregory the Great, Saint Ambrose, Saint Augustine, and Saint Jerome. The "four Doctors" became a commonplace notion among Scholastics theologians, and a decree of Boniface VIII (1298) ordering their feasts to be kept as doubles throughout the Latin Church is contained in his sixth book of Decretals (cap. "Gloriosus", de relique. et vener. sanctorum, in Sexto, III, 22). In the Eastern Church three Doctors were pre-eminent: Saint John Chrysostom, Saint Basil the Great, and Gregory of Nazianzus. The feasts of these three saints were made obligatory throughout the Eastern Empire by Leo VI the Wise. A common feast was later instituted in their honour on 30 January, called "the feast of the three Hierarchs". In the Menaea for that day it is related that the three Doctors appeared in a dream to John Mauropous, Bishop of Euchaita, and commanded him to institute a festival in their honour, in order to put a stop to the rivalries of their votaries and panegyrists. This was under Alexius Comnenus (1081–1118; see "Acta SS. ", 14 June, under St. Basil, c. xxxviii). But sermons for the feast are attributed in manuscripts to Cosmas Vestitor, who flourished in the tenth century. The three are as common in Eastern art as the four are in Western. Durandus (i, 3) remarks that Doctors should be represented with books in their hands. In the West analogy led to the veneration of four Eastern Doctors, Saint Athanasius being added to the three hierarchs. The Four Great Doctors of the Western Church were often depicted in art, here by Pier Francesco Sacchi, c. 1516. From the left: Saint Augustine, Pope Gregory I, Saint Jerome, and Saint Ambrose, with their attributes. The details of the title, Doctor of the Church, vary from one autonomous ritual church to another. In the Latin Church, the four Latin Doctors "had already long been recognized" in the liturgy when the four Great Doctors of the Eastern Church, John Chrysostom, Basil the Great, Gregory of Nazianzus, and Athanasius of Alexandria were recognized in 1568 by Pope St. Pius V.
To these names others have subsequently been added, originally with liturgical effects. The requisite conditions are enumerated as three: eminens doctrina, insignis vitae sanctitas, Ecclesiae declaratio (i.e. eminent learning, a high degree of sanctity, and proclamation by the Church). Benedict XIV explains the third as a declaration by the supreme pontiff or by a general council. But though general councils have acclaimed the writings of certain Doctors, no council has actually conferred the title of Doctor of the Church. The procedure involved extending to the universal Church the use of the Divine Office and Mass of the saint in which the title of doctor is applied to him. The decree is issued by the Congregation for the Causes of the Saints and approved by the pope, after a careful examination, if necessary, of the saint's writings. It is not in any way an ex cathedra decision, nor does it even amount to a declaration that no error is to be found in the teaching of the Doctor. It is, indeed, well known that the very greatest of them are not wholly immune from error. No martyr is in the list, since formerly the Office and the Mass were for Confessors. Hence, as Benedict XIV points out, Saint Ignatius of Antioch, Saint Irenaeus of Lyons, and Saint Cyprian of Carthage are not called Doctors of the Church. The Doctors' works vary greatly in subject and form. 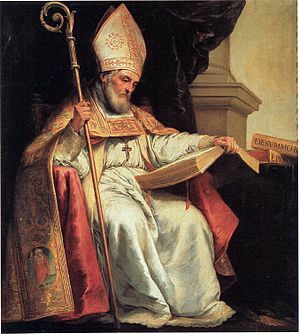 Some, such as Pope Gregory the Great and St Ambrose of Milan, were prominent writers of letters and short treatises. Saints Catherine of Siena and John of the Cross wrote mystical theology. Saints Augustine of Hippo and Bellarmine defended the Church against heresy. Bede wrote biblical commentaries and theological treatises. Systematic theologians include the Scholastic philosophers Saint Anselm of Canterbury, Saint Albert the Great, and Saint Thomas Aquinas. Until 1970, no woman had been named a doctor in the church, but since then four additions to the list have been women: Saints Teresa of Ávila (St. Teresa of Jesus) and Catherine of Siena by Pope Paul VI; Thérèse de Lisieux (St. Therese of the Child Jesus and of the Holy Face), "the Little Flower" by Pope John Paul II; and Hildegard of Bingen by Benedict XVI. Saints Teresa and Therese were both Discalced Carmelites, St. Catherine was a lay Dominican, and Hildegard was a Benedictine. Traditionally, in the Liturgy, the Office of Doctors was distinguished from that of Confessors by two changes: the Gospel reading Vos estis sal terrae ("You are the salt of the earth"), Matthew 5:13–19, and the eighth Respond at Matins, from Ecclesiasticus 15:5, In medio Ecclesiae aperuit os ejus, * Et implevit eum Deus spiritu sapientiae et intellectus. * Jucunditatem et exsultationem thesaurizavit super eum. ("In the midst of the Church he opened his mouth, * And God filled him with the spirit of wisdom and understanding. * He heaped upon him a treasure of joy and gladness.") The Nicene Creed was also recited at Mass, which is normally not said except on Sundays and the highest-ranking feast days. The 1962 revisions to the Missal dropped the Creed from feasts of Doctors and abolished the title and the Common of Confessors, instituting a distinct Common of Doctors. As of 2015[update], the Catholic Church has named 36 Doctors of the Church. Of these, the 17 who died before the Great Schism of 1054 are also held in high esteem by the Eastern Orthodox Church, although it does not use the formal title "Doctor of the Church" in the same way that Catholics do. Among these 36 are 27 from the West and 9 from the East; 4 women; 18 bishops, 12 priests, 1 deacon, 3 nuns, 1 consecrated virgin; 26 from Europe, 3 from Africa, 7 from Asia. More Doctors (12) lived during the 4th century than any other; eminent Christian writers of the 1st, 2nd and 3rd centuries are usually referred to as the Ante-Nicene Fathers, while the 9th, and 20th centuries have so far produced no Doctors at all. The shortest period between death and nomination was that of Alphonsus Liguori, who died in 1787 and was named a Doctor of the Church in 1871 – a period of 84 years; the longest was that of Ephrem the Syrian, which took fifteen and a half centuries. On 20 August 2011, Pope Benedict XVI announced that he would soon declare St. John of Ávila a Doctor of the Church. Although no official announcement was given, it was reported in December 2011 that Pope Benedict intended to declare Hildegard of Bingen as a Doctor of the Church despite her not yet having been officially canonized. St. Hildegard of Bingen was officially declared to be a Saint of the universal Church by Pope Benedict XVI on 10 May 2012, clearing the way for her to be named a Doctor of the Church. Pope Benedict formally declared St. John of Ávila and Hildegard of Bingen to be Doctors of the Church on 7 October 2012. Pope Francis declared the 10th century Armenian monk Saint Gregory of Narek to be the 36th Doctor of the Church on 21 February 2015. The decision was somewhat controversial. According to critics of Pope Francis' decision, Saint Gregory was monk of the Armenian Apostolic Church, which, like other Oriental Orthodox Churches, split off from the rest of Christendom over the Council of Chalcedon in 451 AD. Therefore, Saint Gregory is seen by some as a Monophysite who was in union with neither Catholic or Eastern Orthodox Christians at the time of his death in 1003. The Oriental Orthodox churches, which the Armenian Church is an integral part of, are Miaphysites. Defenders of the decision, however, have cited historical evidence that Narek Monastery, where Saint Gregory lived and died, was a center of opposition to Monophysitism from inside the Armenian Church. It is also cited that Saint Gregory of Narek is listed in the Roman Martyrology with a feast day of February 27th and that members of the Armenian Catholic Church have always had a strong devotion to him and his writings. In a departure from previous practice, neither Benedict XVI nor Francis ordered the Doctors of the Church they had created to be inscribed in the General Roman Calendar. * indicates a saint who died before 1054, and is therefore also held in high esteem by the Eastern Orthodox Church. 1. St. Gregory the Great* One of the four Great Latin Fathers 540 (ca.) 604 1298 Pope, O.S.B. (Common Doctor) 1225 1274 1567 Priest, Theologian, O.P. (Seraphic Doctor) 1221 1274 1588 Cardinal Bishop of Albano, Theologian, Minister General, O.F.M. (Marian Doctor) 1033 or 1034 1109 1720 Archbishop of Canterbury, O.S.B. 15. St. Peter Damian 1007 1072 1828 Cardinal Bishop of Ostia, monk, O.S.B. (Mellifluous Doctor) 1090 1153 1830 Priest, O.Cist. (Doctor of Charity) 1567 1622 1877 Bishop of Geneva, C.O. (Doctor of the English) 672 735 1899 Priest, monk, O.S.B. 25. St. Peter Canisius 1521 1597 1925 Priest, S.J. 27. St. Robert Bellarmine 1542 1621 1931 Archbishop of Capua, Theologian, S.J. (Universal Doctor) 1193 1280 1931 Bishop of Regensburg, Theologian, O.P. (Evangelical Doctor) 1195 1231 1946 Priest, O.F.M. (Apostolic Doctor) 1559 1619 1959 Priest, Diplomat, O.F.M. Cap. In addition, parts of the Catholic Church have recognised other individuals with this title. In Spain, Fulgentius of Cartagena, Ildephonsus of Toledo and Leander of Seville have been recognized with this title. In 2007 Pope Benedict XVI, in his encyclical Spe Salvi, called Saint Maximus the Confessor "the great Greek Doctor of the Church", though the Congregation for the Causes of Saints considers this declaration an informal one. Though not named Doctors of the Church or even canonized, many of the more celebrated doctors of theology and law of the Middle Ages were given an epithet which expressed the nature of their expertise. Among these are Bl. John Duns Scotus, Doctor subtilis (Subtle Doctor); Bl. Ramon Llull, Doctor illuminatus (Illuminated Doctor); Bl. John of Ruysbroeck, Doctor divinus ecstaticus (Ecstatic Doctor); Alexander of Hales, Doctor irrefragabilis (Unanswerable Doctor); Roger Bacon, "Doctor Mirabilis" (Wondrous Doctor); Gregory of Rimini, Doctor authenticus (Authentic Doctor); Jean Gerson, Doctor christianissimus (Most Christian Doctor); Nicholas of Cusa, Doctor christianus (Christian Doctor); and the priest and professor Francisco Suárez, Doctor eximius (Exceptional Doctor). The Syro-Malabar Catholic Church recognises Ambrose, Jerome, Gregory, Augustine, Athanasius, Basil, Gregory of Nazianzus and John Chrysostom, as well as Ephrem the Syrian, Isaac the Elder, Pope Leo I, John of Damascus, Cyril of Alexandria, Cyril of Jerusalem, Epiphanius of Salamis and Gregory of Nyssa. The Chaldean Catholic Church honours as doctor Polycarp, Eustathius of Antioch, Meletius, Alexander of Jerusalem, Athanasius, Basil, Cyril of Alexandria, Gregory Nazianzus, Gregory of Nyssa, John Chrysostom, Fravitta of Constantinople, Ephrem the Syrian, Jacob of Nisibis, Jacob of Serugh, Isaac of Armenia, Isaac of Nineveh, and Maruthas. The Eastern Orthodox Church honors many of the pre-schism saints as well, but the term "Doctor of the Church" is not applied in the same way. One consistent use of the category is the trio of Basil the Great, Gregory of Nazianzus and John Chrysostom, recognized as universal teachers and known as the Three Holy Hierarchs. The Church also recognizes three saints with the title Theologos (Theologian): St. John the Evangelist, St. Gregory of Nazianzus and St. Symeon the New Theologian. The Armenian Apostolic Church recognizes the Twelve Holy Teachers (Vardapets) of the Church: Hierotheus the Thesmothete, Dionysius the Areopagite, Pope Sylvester I, Athanasius of Alexandria, Cyril of Alexandria, Ephrem the Syrian, Basil the Great, Gregory Nazianzus, Gregory of Nyssa, Epiphanius of Salamis, John Chrysostom, and Cyril of Jerusalem. They also recognize their own saints Mesrob, Eliseus the historiographer, Moses of Chorene, David the philosopher, Gregory of Narek, Nerses III the Builder, and Nerses of Lambron. The Assyrian Church of the East recognizes Eliseus, Diodore of Tarsus, Theodore of Mopsuestia, and Nestorius as Doctors of the Church. Since all of the above appear in the calendar at the level of Lesser Festival or Commemoration, their celebration is optional. Similarly, because "In the Calendar of the Saints, diocesan and other local provision may be made to supplement the national Calendar", those Doctors of the Church recognized by the Catholic Church may also be celebrated in the Church of England. The Lutheran calendar of saints does not use the term "Doctor of the Church." The calendar of the Lutheran Church–Missouri Synod refers to Martin Luther by the title of "Doctor" in recognition of his academic degree, Doctor of Theology from the University of Wittenberg in 1512. ^ Rice, Fr. Larry (2015). "Doctors of the Church?" (PDF). usccb.org. United States Conference of Catholic Bishops. Retrieved 9 October 2018. ^ "St. Therese, Doctor of the Universal Church – Saint Therese of Lisieux". thereseoflisieux.org. ^ "Pope to proclaim St John of Avila Doctor of the Universal Church". News.va. Holy See. 20 August 2011. Retrieved 21 August 2011. ^ "Pope to Canonize and Name Hildegard of Bingen as Doctor of the Church". Archived from the original on 2012-01-07. ^ "ROME REPORTS TV News Agency". www.romereports.com. Archived from the original on 2012-05-12. ^ "Pope : Two new Doctors of the Church". news.va. ^ "San Gregorio di Narek Dottore della Chiesa Universale, 23.02.2015" (in Italian). Holy See Press Office. 23 February 2015. ^ William of Malmesbury, Gesta pontificum Anglorum 1.29 Hamilton, N.E.S.A. (1870). Willelmi Malmesbiriensis Monachi De Gestis Pontificum Anglorum libri quinque (in Latin). London: Longman. p. 44. ^ "Encyclical of Pope Benedict XV on St. Ephrem the Syrian". October 5, 1920. Retrieved March 16, 2016. ^ "Albert the Great (Stanford Encyclopedia of Philosophy)". March 20, 2006. Retrieved March 16, 2016. ^ "Proclamation of Saint Teresa of Avila Doctor of the Church". September 27, 1970. Retrieved March 15, 2016. ^ McCarthy, Emer. "Pope Francis declares Armenian saint Doctor of the Church". Vatican Radio. Retrieved February 23, 2015. ^ Benedict XVI (2007). "Spe Salvi". The Holy See. ^ "Feast of the Three Holy Fathers, Great Hierarchs and Ecumenical Teachers, Basil the Great, Gregory the Theologian, and John Chrysostom". Greek Orthodox Archiocese of America. Retrieved 20 May 2016. ^ Casiday, Augustine (2012). The Orthodox Christian world (PDF). New York: Routledge. p. 6. ISBN 978-0-203-11938-9. Archived from the original (PDF) on 2016-09-24. Retrieved 20 May 2016. ^ "Saints and Feasts". Armenian Church Catholicosate of Cilicia Antelias – Lebanon. Retrieved 12 November 2015. Wikimedia Commons has media related to Doctors of the Church. "Doctors of the Catholic Church". "1917 Catholic Encyclopedia: Doctor of the Church". Archived from the original on Feb 2, 2000. Connor, Ft. Charles P. (ed.). "Doctors of the Church". EWTN. "Selected writings of the Doctors of the Church" (in English, German, Italian, and Spanish). Archived from the original on Jul 1, 2018.